Q: If you could time travel back to issue 1 and say anything to the Ayun of that era, what would it be? Actually, what FIVE things would you say? 1. Move to Brooklyn immediately and figure out a way to buy a building. It will involve lots of boring numbers and require you to fill out forms and be organized in a way that does not come naturally, but I think in 15 years (or less!) you will be very glad you did. 2. Enjoy the culture books and newspapers and personal letters, for soon a pernicious and addictive phenomenon known as social media will sweep the land. 4. Since you get such pleasure from comics and graphic novels, why not render the zine in that kind of format? You could go to comics festivals and have entree into a whole scene populated with people you could enjoy as actual friends, rather than just authors to be admired or envied. 5. When you find yourself approaching issue 37, be forewarned that that middle school you think is so wonderful is not what it appears to be. I know it doesn’t feel like you’re wearing blinkers, but that’s the Kool-Aid you drunk talking. 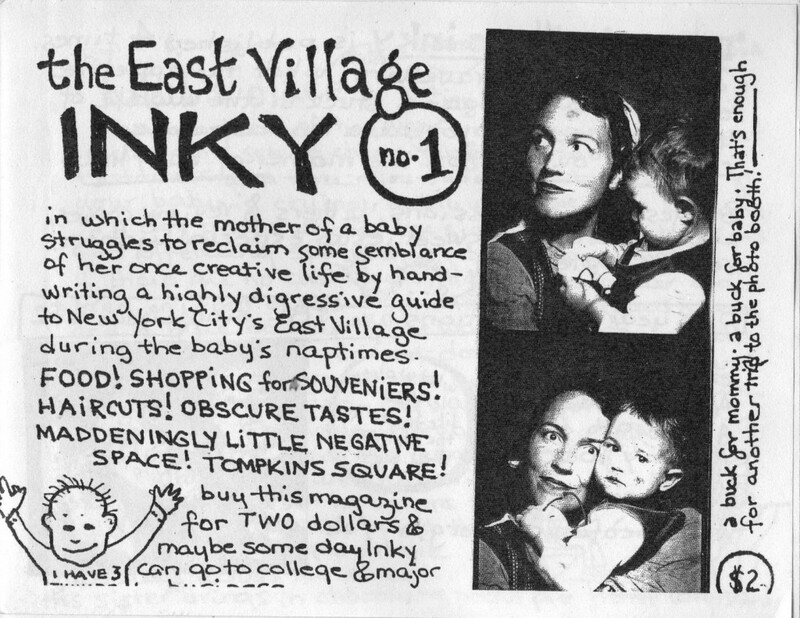 In keeping with the NYC kick I’ve been on since returning, here’s a cool interview including lots of going-back-in-time-to-advise-yourself-and-others-type questions with East Village Inky‘s Ayun Halliday. The interview was done after her publishing of the 51st issue of the EVI. As a person who struggles to get one zine a year done, I am totally in awe of her for hitting this milestone and being under 70 years old. Recalls Ker-bloom!’s 100th issue celebration, too.